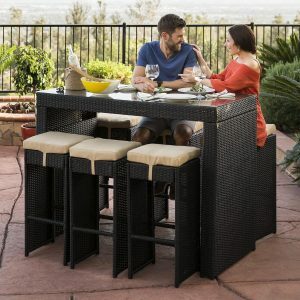 **7-Piece Wicker Bar Patio Dining Set from bestchoiceproducts. Price: $349.99. Discount: $650.00. Categories: House, Outdoor, Patio, Furniture. Deal Rating: 5 Stars out of 5. Store Rating: 5 Stars out of 5. Deal Recommendation: Recommended. Available Until: Limited Quantity. Thoughts: Clearance – 7-Piece Wicker Bar Patio Dining Set. Deal Score: 95 out of 100.